Over at my Zazzle store, I’m having a special event! Starting April 1, every day will see the release of a new product line featuring my Floral Alphabet series. These are the same flowers that you’ve been seeing here and at my RedBubble site, now on a full product line that includes mugs, pendants, coasters keychains, iPhone and iPad cases, and even postage stamps. 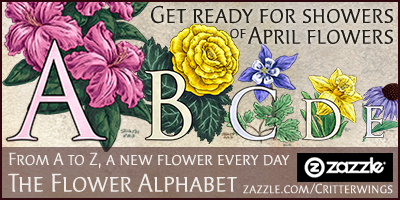 Check out the Flower Alphabet section of my store, it all kicks off today, April 1 with “A for Azalea” … see you there! This entry was posted in Critterwings, flower by stephanie. Bookmark the permalink.